The first few years of a child’s life is a time filled with laughter, joy, and new experiences! Add to the adventure with these wonderful gifts designed to bring a smile to your precious little one’s face and preserve the memories that you will look fondly upon in years to come. We go over the top ten baby gifts perfect for any occasion – a baby shower, first birthday, christening or holiday. Everyone wants to look back and relive priceless moments from their first couple years! This silver plated Little Star photo album is the perfect place to keep all the captured memories together and is sure to last a lifetime of laughs and nostalgia. All babies need one! This cute and simple cotton-poly blend baby bib stands out from the rest with the personalization of the baby’s name, nickname, or phrase of choice. And did we mention a matching newborn hat is available by request? Can you say adorable?! A baby’s first year is full of unforgettable experiences for new parents that will one day want to be shared with their child! 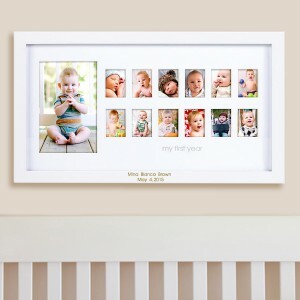 Keep track of all the best moments from each month during their first year with this unique white wooden baby frame, personalized with their name and date. An excellent gift for any new baby, these adorable bodysuits are made of a poly/cotton blend and are personalized with the baby’s name along with a monogram in your choice of pink or blue. These will guarantee a smile on the parents’ face for a baby shower, holiday or any gift-giving occasion. No one forgets their first time waiting for the tooth fairy – so why not memorialize the occasion with something special? This silver-plated tooth fairy box contains an embossed moon and fairy design on the lid and is lined in plush blue velvet in order to keep the child’s tooth safe from being lost or broken. All parents want to capture the pivotal moment of a baby’s first milestone. Whether it be their first steps, words, bath or birthday, this adorable silver plated frame is designed to celebrate the moment. 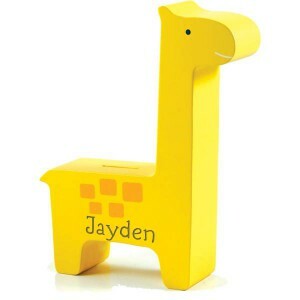 A great choice for either a boy or girl, this brightly colored wooden giraffe coin bank will bring joy to any child’s room decor! The personalization of their name on the side of the giraffe only adds to the uniqueness of this gift – which can be used to store coins or keepsake notes. 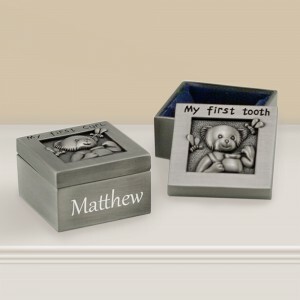 Place a locket of fine baby hair or a first baby tooth inside this small pewter box designed to keep treasured memories tucked safely away! Lined in dark blue velvet and a plush nest, these valued keepsakes are ensured from being lost or damaged. The non-tarnish brushed pewter finish will keep the box looking beautiful for many years to come. 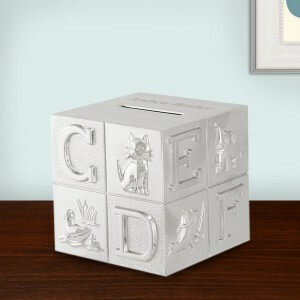 Featuring alphabet letters and animals in elegant silver, this baby block coin bank is designed to be part of the quintessential baby nursery! This coin bank has a top slot for inserting change and space to personalize it with the name or special greeting of your choice. Fulfill a child’s desire for adventure with this spunky take on the classic piggy bank. 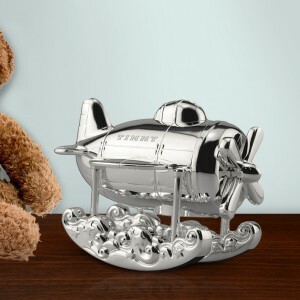 This personalized silver piggy bank gently rocks on playfully designed clouds sure to both entertain your little one and encourage them to store some savings! 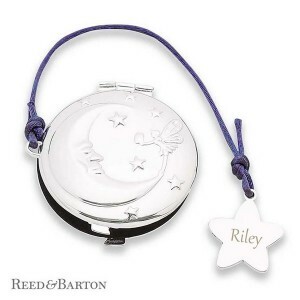 Monogram their name for that ideal touch of personalization. What a fabulous baby’s gift that can give a precious smile on your little one’s face. At child to cherish’s gift store you can find a special gift for your little one and even gift some other baby. Kids really do love personalized things. What a fantastic baby’s gift that can give a precious smile on your little one’s face. At child to cherish’s gift store you can find a special gift for your little one and even gift some other baby. Kids really do love personalized things.